The Junior year is the year that colleges will focus on. They would rather see a C+ in a challenging advance class than an A+ in a low level class. Senior Marie Russ agrees, “Take the more challenging classes… [they] look good on college applications.” Also junior year, take the SAT or the ACT. But if the Junior year of high school is the hardest, then Senior year is the most stressful, with the daunting task of applying to colleges and passing the classes you need to graduate. Senior year, you need to take challenging classes so it doesn’t seem like you’re slacking off, apply to colleges and scholarships, get your stuff (baby picture, final farewell, etc.) into the yearbook, and actually pass your classes. In your freshman and sophomore year, you have a much more strict schedule, with classes that you have to take in order to graduate. In junior and senior year, you have more freedom to challenge yourself. I would recommend challenging yourself in those years as much as you can, because you will grow as a student and a person by doing that, but also colleges will see that you were determined and took challenges when you could. 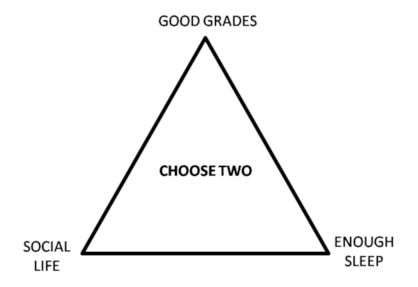 This diagram is how many people see the dilemma facing students in this stressful part of high school. The option of choosing a social life and good grades means you won’t get enough sleep. Teens need 8-10 hours of sleep to function properly. According to a study the National Sleep Foundation conducted, only 15 percent of students got eight and a half hours of sleep on a school night. Yet, if you choose good grades and enough sleep, you won’t have time for a social life. This is also saying that your grades will slip if you choose a social life and enough sleep. Many students agree this next illustration is a more accurate model with everything they have going on in life. Not to mention adding another category for college applications. Do all of the things seniors have going on in their lives actually cause them stress, or is that picture an over exaggeration? According to Russ, “This year, as a senior, is significantly more stressful [than junior year].” She’s mostly worried about getting into her reach college, Dartmouth, because it’s very hard to get into. Goddard is worried about meeting her January 1st deadline while Russ was worried about meeting her deadline for her essay (she barely submitted them in time). Russ says, “It’s difficult to get things in on time, especially the essays, because I need to work with Mary, the White Table Academic Support Coordinator, on them, and we don’t always have time.” Both Goddard and Russ agree that the essays are one of the more difficult parts of the application process. Great article! 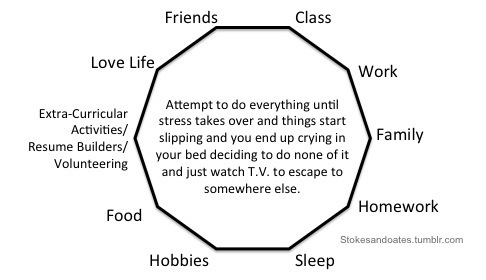 Speaking as a mom of a senior, I think the circular diagram is so accurate. Hang in there everyone!